Beads from Beneficiaries is an opportunity for supporters to celebrate this holiday season by sending a heartfelt gift with the power to lift a family out of poverty – and it’s wrapping up next Friday, December 17th. Those who make a $10 donation to FXB in honor of their friends and family, will be sent a card informing their honoree of their gift! 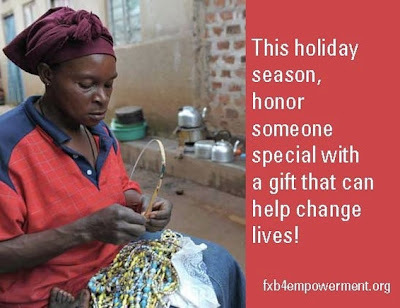 As a special touch, for individuals who donate $40 we will send a handmade, gift-wrapped beaded necklace made by a woman enrolled in FXB's program in Uganda along with the card. Each beautiful beaded necklace represents an environmentally and socially responsible solution to overcoming the affects of poverty and AIDS. The women in FXB’s programs often have no means of earning an income prior to joining the FXB-Village program. Many are widows and mothers struggling to support the children in their care. FXB provides these women with the tools they need to become self-sufficient, including skills training and supplies to start a new trade. Many of FXB’s beneficiaries choose to make necklaces by hand from recycled paper and glass beads as their income generating activity. 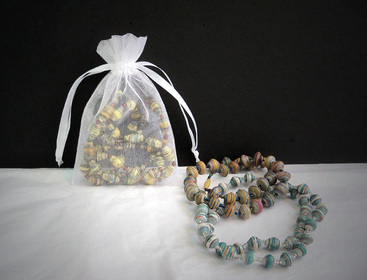 Colorful paper is hand rolled to create festive beads, giving each necklace a unique appearance. The income these women make selling their crafts at the local markets allows them to feed their families, buy uniforms and pay school fees for their children, receive medical treatment, and open savings accounts to prepare for the future! Your thoughtful gift this holiday season will help FXB provide a comprehensive package of support to more families so that they may escape poverty forever. 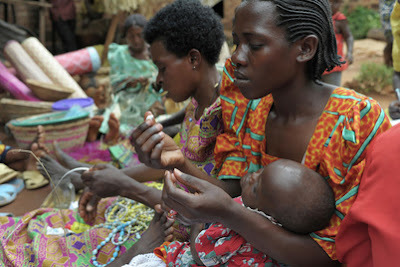 Photo of mothers in Uganda making necklaces by hand to earn an income. Your donation will help FXB continue to provide medical, nutritional, psychological, and educational support and other services to these women and their families so they can escape poverty. KPFA Radio/Ann Garrison: "Oil, African Genocide, and the USA's LRA Excuse"
NOTE to self. Re-read the below copied report written by Ann Garrison. The report was published yesterday at her blog titled Ann Garrison. According to Ms Garrison's blogger profile, she is located in San Francisco, California, USA. 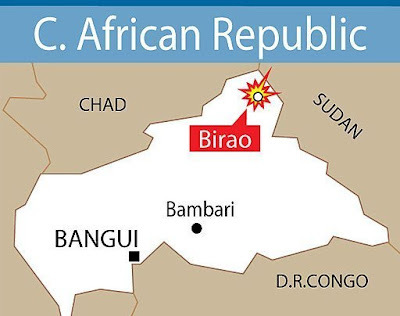 Also, copied here below is a map published Nov. 25 at this site's sister blog Congo Watch: "CAR: CPJP rebels kill 4 soldiers, hold Birao garrison town near border with Chad and Sudan". The President seemed either unaware or unconcerned about the UN Mapping Report, released on October 1st, which documents Ugandan President Yoweri Museveni's army's war crimes, crimes against humanity, and genocidal massacres of civilians, Rwandan Hutu refugees and Congolese Hutus, in the Democratic Republic of Congo. How else could he propose to mobilize the very same army to enter the Central African Republic and Southern Sudan to protect civilians and refugees, and "meet humanitarian requirements" in "affected populations," as his strategy statement said he would? NBC's Dateline last night aired an hour long documentary titled "Winds of War, George Clooney in Sudan." The actor warned Dateline's audience that Sudanese President Omar Al-Bashir's regime in Khartoum has already been indicted, by the International Criminal Court, for war crimes and genocide, and that he is now amassing weapons and troops to prevent Southern Sudan from forming an independent state. Critics of U.S. interventions in the region say that the U.S. is also amassing weapons and troops to move on Southern Sudan, from the Central African Republic, and from its southern border with Uganda, to secure oil. Ann Garrison is live in the studio with this report. George Clooney, on Friday night's NBC Dateline, cited the opinions of Secretary of State Hillary Clinton, the CIA, and President Barack Obama as evidence that everyone agrees that the U.S. must engage to stop genocide after Southern Sudan's January referendum, in which the Southern Sudanese are all but certain to vote for independence. The State Department said, the Secretary of State said it's a ticking time bomb. The CIA said this is the next genocide if we're not careful; it is the biggest risk. The President has said as much. This, everyone acknowledges that this is what is going to take place if someone doesn't moderate and mediate. And that's not just my saying it. That's everyone saying it. I'm just trying to say it as loud as possible. Clooney's "everyone" did not include Ugandan American journalist Milton Allimadi, Editor of the New York City-based Black Star News. Allimadi says that if the President were really serious about stopping genocide in Africa, he would send peacekeepers into eastern Congo, where the worst African genocide is ongoing and has been for the past 16 years, with a loss of over 6 million lives. Allimadi also said that Obama would not be martialing the Ugandan army of Yoweri Museveni in Northern Uganda, to move into the Central African Republic and Southern Sudan, enacting the LRA DIsarmament Act, after the October 1st release of the UN Mapping Report documenting the Ugandan Army's war crimes, crimes against humanity, and genocidal massacres of Hutu civilians in Congo. Allimadi says the LRA is really an excuse to secure Southern Sudanese oil after Southern Sudan's January referendum on independence. I don't buy this LRA business, not for one minute. The United States is not interested in going after the LRA. If the Ugandan government, which is familiar with the terrain, could not defeat the LRA in 24 years of conflict, what added dimension can the United States bring to this? We already saw one disastrous instance, in December 2008, using U.S. logistical support and intelligence, the Ugandan Army attacked the LRA camp at Garamba, in the Democratic Republic of Congo. And the consequences were just disastrous. They failed to get the key leaders of the LRA and instead provoked massacres of innocent Congolese civilians. Who knows who did the killings, whether it was the LRA or the Ugandan troops? It was a massive disaster. As you know, in early January, Southern Sudan, whose capitol is Juba, is going to vote on a referendum. That referendum will decide whether it becomes an independent republic, and it's a foregone conclusion that they're going to vote for independence. Now here's the deal. Most or all of the oil wealth that is now sustaining the government of Sudan in the North happens to be located in Southern Sudan. I don't see how the government in Khartoum can survive and sustain itself without this oil wealth. I think the U.S. has taken a keen interest in the management and control of this oil wealth. And if you look at the map very carefully, the LRA right now, is purported to be concentrated in Central African Republic, which also conveniently happens to be bordered with the Sudan. It's on the southwestern part of the Sudan's border, so they share a border. And in fact, if you're going to look at it from a military point of view, it's half the distance to march from the outpost of the border in Central African Republic to the capitol of Khartoum than it is to march from Juba, the capitol of Southern Sudan, to Khartoum. I am convinced that the United States, with its ally, the Ugandan dictator Yoweri Museveni, are setting up a front line in Central African Republic, in order to weaken the government of the Sudan in Khartoum and make it difficult for the government of the Sudan in Khartoum to launch an attack against Southern Sudan, should they declare independence, which is a foregone conclusion. That to me is a much more credible story than this bogus story about the U.S. wanting to go after the LRA. And do you think they want to do this in order to secure Southern Sudanese oil reserves? Absolutely. Southern Sudanese oil reserves. And that is becoming a huge oil field now. Southern Sudan borders northern Uganda. And going from that region into Western Uganda, that's a vast oil field. As you know in recent years there's been massive discoveries of oil fields in that part of Uganda as well. So if you look at this as a continuous region, starting from Western Uganda sweeping into Northern Uganda, into Southern Sudan, very rich oil fields, which, considering the U.S. presence in the region right now, is much more secure than some of the oil fields in the Middle East. President Obama himself, in his 2006 Senate Bill, the Obama Congo Relief, Security, and Democracy Promotion Act, said that rebel militias serve as pretexts for Uganda and Rwanda's invasions and resource plunder of neighboring Congo, but Allimadi says that Obama, the U.S. Africa Command, and federal legislators now seem to be using the pretext themselves. For Pacifica/KPFA Radio, I'm Ann Garrison. (KIGALI) - The government of Uganda, on Wednesday, extradited to Rwanda a genocide fugitive who was arrested last month. Jean Pierre Kwitonda alias Kapalata was arrested by the Uganda police on November 4 in Lukaya, Masaka District following a red notice issued by Interpol Rwanda. He has since been detained at Kireka police station, a suburb of the Ugandan capital Kampala. Kwitonda was handed over by Charles Tumwesigye, from Interpol Directorate in Kampala. Tony Kulamba, head of Interpol Rwanda received the suspect at Gatuna border post. Kwitonda who fled the country in 1997 is charged with six counts, including Genocide, complicity in genocide and conspiracy to commit genocide. He also faces murder charges, extermination, formation, membership, leadership and association of criminal gangs whose purpose and existence was to do harm to people or their properties, according to the indictment. The suspect had been handed a 19-year sentence in absentia by a Gacaca court in Gikondo, where he allegedly committed the crimes during 1994 genocide against the Tutsi. “During Genocide, Kwitonda is said to have acted individually, or as a part of a joint criminal enterprise with some members of the ex-Far, Interahamwe leaders, interim government authorities that executed the genocide and other known or unknown to prepare, train, equip and organize militias under his supervision in former Gikondo Commune, then Kigali Prefecture,” a statement by Interpol partly reads. During the Genocide, Kwitonda who was then 20, headed the Gikondo youth wing of MRND, the ruling of former President Juvénal Habyarimana which planned and executed the genocide. A number of witnesses in the area had testified on how he championed the extermination of Tutsis in 1994. He had been a well established businessman in Lyantonde trading centre, importing goods from Tanzania, Kenya and Sudan. During his time in Uganda, Kwitonda married a Rwandan woman with whom they had four children. “I officially hand over Kwitonda Jean Pierre alias Kapalata as per the table request by Rwanda,” Tumwesigye said handing the fugitive and his case file to Kulamba.